Cyril Duncan was the son of Brian and Lek Duncan of Portmarnock, Co Dublin, Ireland and brother of Garmon, Genevieve and Pamela Duncan. Cyril died suddenly and unexpectedly on 7th June 2008 in Bangkok, Thailand, aged 31 years. Cyril's mother, Lek, was from Thailand. Cyril loved Thailand and was teaching children in Bangkok at the time of his sudden death and had been doing so for some time. He was very happy working there. Cyril's parents, brother and sisters have set up a fund and have set up this charity in memory of Cyril. The monies raised by the Charity in Ireland are to go to underprivileged and disadvantaged children in Thailand, primarily by transferring the funds raised in Ireland to the charities in Thailand. Siam, as you are aware, is the former name for Thailand itself. Siam in Thai means "smile". Everyone who knew Cyril can confirm that Cyril had a beautiful, radiant and almost constant smile which warmed all he came in contact with. The Safe Haven Orphanage, Tha Song Yang, Thailand / Burma border. Dedicated to helping poor children in Bangkok and throughout Thailand. The account is in the name of 'The Cyril Duncan Siam Children's Foundation', and is with Ulster Bank, Main Street, Malahide, Co. Dublin. It is a fundamental principle of the family in setting up this Charity that the funds should go directly to the children’s charities in Thailand. All the administration and other costs in Ireland will be borne by Cyril's family. The family has chosen reputable charities in Thailand, where possible with minimum administration costs to ensure that the vast bulk of the monies raised in Ireland will go directly for the benefit of the children in Thailand. The family also wishes through the Charity to raise awareness of the plight of disadvantaged children in Thailand as well as all the details of the individual charities selected. The family, in picking specific Thai charities and organisations, would like contributors to be aware of the children’s circumstances, and the ethos and details of the charity in Thailand insofar as it is possible. The family is hoping that this awareness may lead to Irish people and other nationalities getting involved with the individual charities themselves, for the benefit of children in Thailand. This special section will deal with the Charity, details of where the money will be spent and details of the children centres, shelters and children hospices and hospitals where the Cyril Duncan Siam Children's Foundation monies will be allocated. At the start of every year everyone in Irish Life gets to vote to pick two charities of their choice, one an Irish charity working at home and one an Irish charity working abroad. 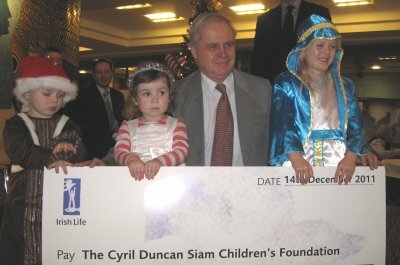 In 2011 they picked Our Lady’s Hospital for Sick Children’, Crumlin and ‘The Cyril Duncan Siam Children’s Foundation’ which supports projects for vulnerable children in Bangkok, Thailand. The Foundation is deeply indebted to all those who organised, participated and supported the Irish Life initiative. The funding received will help to ensure that the Foundation can continue its work into the future. If you have any further queries in relation to the Foundation or any suggestions or are aware of any charities in Thailand that you would like to be considered you can contact Cyril's family at 9 Carrickhill Heights, Portmarnock, Co. Dublin. Alternatively, you can e-mail us from the e-mail link on the Home Page.